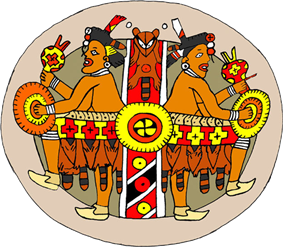 The Mississippian culture was a mound-building Native American civilization that flourished in what is now the Midwestern, Eastern, and Southeastern United States from approximately 800 to 1600, varying regionally. Composed of series of urban settlements and villages (the largest city being Cahokia) and linked together by a loose trading network. The Mississippi stage is usually divided into three or more chronological periods. Each period is an arbitrary historical distinction varying regionally. At one site, each period may be considered to begin earlier or later, depending on the speed of adoption or development of given Mississippian traits. 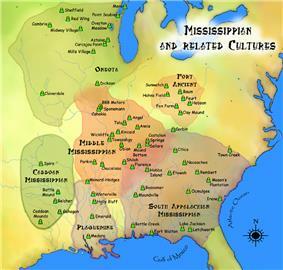 The "Mississippi period" should not be confused with the "Mississippian culture". The Mississippi period is the chronological stage, while Mississippian culture refers to the cultural similarities that characterize this society. Early Mississippi period (c. 1000–1200 CE) had just transitioned from the Late Woodland period way of life (500–1000). Different groups abandoned tribal lifeways for increasing complexity, sedentism, centralization, and agriculture. Production of surplus corn and attractions of the regional chiefdoms led to rapid population concentrations in major centers. 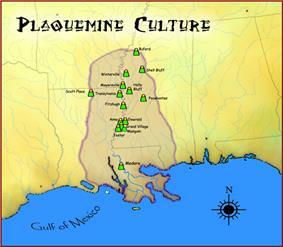 Pauketat, Timothy R.; "The History of the Mississippians" in North American Archaeology. Blackwell Publishing Ltd., 2005. ^ Chastaina, Matthew L.; Deymier-Black, Alix C.; Kelly, John E.; Brown, James A.; Dunand,David C. (July 2011). "Metallurgical analysis of copper artifacts from Cahokia". Journal of Archaeological Science 38 (7): 1727–1736. ^ Sullivan, Lynne P., Archaeology of the Appalachian Highlands, Univ. of Tennessee Press, 2001 ISBN 1-57233-142-9. 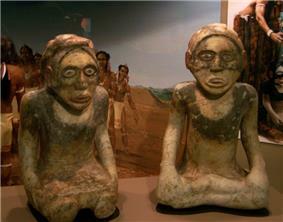 ^ a b c "Southeastern Prehistory:Mississippian and Late Prehistoric Period". ^ "Southeastern Prehistory: Mississippian and Late Prehistoric Period". "National Park Service". Retrieved 2007-12-04. ^ Ferguson, Leland G. (October 25–26, 1974). Drexel A., Peterson, ed. South Appalachian Mississippian : A Definition and Introduction (PDF). Thirty First Southeastern Archaeological Conference. Atlanta, Georgia. pp. 8–9. At Spanish explorers of the Juan Pardo expedition, who built a base there in 1567 called Fort San Juan. Expedition documentation and archaeological evidence of the fort and Native American culture both exist. The soldiers were at the fort about 18 months (1567–1568) before the natives killed them and destroyed the fort. (They killed soldiers stationed at five other forts as well; only one man of 120 survived.) Sixteenth-century Spanish artifacts have been recovered from the site, marking the first European colonization in the interior of what became the United States. 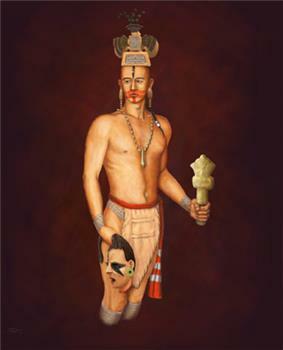 Mississippian peoples were almost certainly ancestral to the majority of the American Indian nations living in this region in the historic era. The historic and modern day American Indian nations believed to have descended from the overarching Mississippian Culture include: the Alabama, Apalachee, Caddo, Chickasaw, Choctaw, Muscogee Creek, Guale, Hitchiti, Houma, Kansa, Missouria, Mobilian, Natchez, Osage, Quapaw, Seminole, Tunica-Biloxi, Yamasee, and Yuchi. Emerald Mound: A Plaquemine Mississippian period archaeological site located on the Natchez Trace Parkway near Stanton, Mississippi. The site dates from the period between 1200 and 1730 CE. 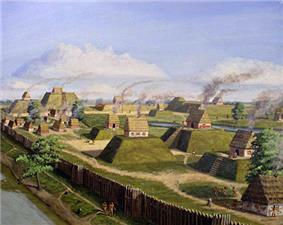 The platform mound is the second-largest Pre-Columbian earthwork in the country, after Monks Mound at Cahokia. 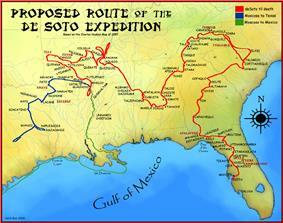 Hernando de Soto led an expedition into the area in the early 1540s, he Hasinai, Kadohadacho, and Natchitoches, which were all linked by their similar languages. 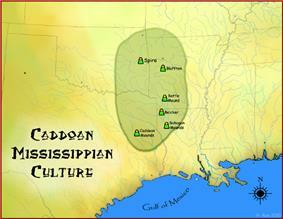 The Caddoan Mississippian area, a regional variant of the Mississippian culture, covered a large territory, including what is now eastern Oklahoma, western Arkansas, northeastern Texas, and northwestern Louisiana. Archaeological evidence has led to a scholarly consensus that the cultural continuity is unbroken from prehistory to the present, and that the direct ancestors of the Caddo and related Caddo language speakers in prehistoric times and at first European contact and the modern Caddo Nation of Oklahoma.